The All New, All Daring Delusional Honesty! : At Last: The Monster & The Mercenary! Have you ever seen story, or art, that needed attention? That's how I'm feeling right now. A while back I became aware of an artist's work--I first saw it, I think, in the Hero Initiative's Hulk 100 Project (available in softcover or hardcover from my local comic shop, Atomic Comics). This artist, whose name is hardly recognized in the U.S., has a crystal-clear appreciation for the work of early Hulk artists, particularly the great Sal Buscema, Ernie Chan, and other talents who had their heyday at Marvel during the 1970s. His name is Simon Williams (not to be confused with that other Simon Williams, Marvel Comics' Wonder Man) and to old-time Hulk fans like yours truly, his work is a revelation. He's also done some artwork on the DVD covers to all the Hulk's animated series in the United Kingdom--and done a bang-up job on each volume. I had to find more, and find it I did. Recently, I had the opportunity to read his sketchbook, Soulman Inc. Sketchbook: The Comic Artwork of Simon Williams. In the tradition of those kooky 70s classics! I know, I know: "Gary," you ask, "How do you read a sketchbook? Aren't you just supposed to look at the pretty pictures?" While that may be true with ordinary sketchbooks, this one has a special genesis. While taking a break from drawing comics, Simon would doodle from time to time, and as should be obvious, the Hulk is just about his favorite character. But he also holds the original bounty hun--er, "freelance peacekeeping agent" Death's Head in high esteem. So a series of sketches became a comic pitting the two characters against each other. It started over on Deviant Art, but soon mutated, until the finished product became available in this sketchbook, available at conventions the artist attended. I'm betting copies of it are long gone, but the story inside, well, it's a real treat. 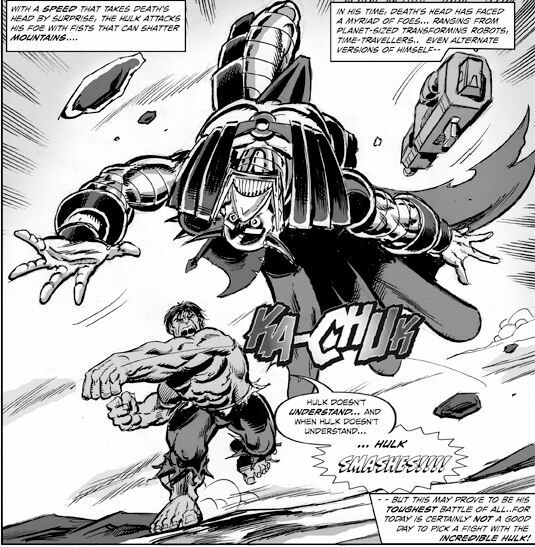 Written and drawn by Williams, who freely acknowledges the work of many of the characters' greatest writers and artists, "The Monster and the Mercenary" is a 17-page smashfest. Its page count and overall tone echo the era in which the story is set, shortly following the death of the Hulk's beloved Princess Jarella (circa The Incredible Hulk #205). The tale is simple: still reeling from losing his love, the Hulk seeks solitude in the desert, but instead finds the first Death's Head, hired by persons unknown to off the Green Goliath. Along the way, Williams includes a some delightful cameos from other characters familiar to readers of both US and UK audiences, as well as nods to past and current continuity. Why must Hulk always be alone? Overall, "The Monster and the Mercenary" is a great deal of fun, well deserving of a wider audience beyond the print run of the sketchbook. 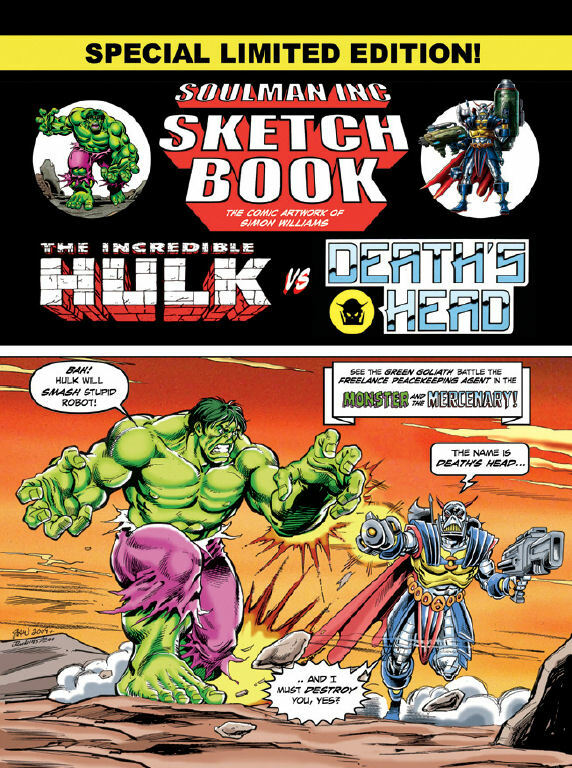 Fortunately, Williams' work on this sketchbook has led to a "real" battle between Death's Head and the Hulk in the March issue of the UK magazine Marvel Heroes. In fact, I've been able to interview Simon Williams about that particular 8-page adventure that's being printed in full color. If you're lucky, sometime soon after I post this little review, you'll be able to see that article as hosted by the good folks over at iFanboy.com! Simon's an underrated talent deserving of wider recognition. You can see his Deviant Art gallery from the link up above, plus he's got a blog of his own here. If veteran inker Joe Rubinstein calls him one of the best Hulk artists he's ever had the pleasure of inking (and he's inked Sal Buscema, the Romitas, Herb Trimpe and Dale Keown! ), then I think that really says something. Pay him a visit, ladies and gents! Oh, and by all means, spread the love everywhere you can online, and maybe the U.S. will see the new Death's Head/Hulk story. It could happen, yes? Gary, is this story with Death's Head 1 or 2? Death's Head 2 is shown to have been based on the Plank Hulk Death's Head. I heard this was in a issue of Nova they revealed this. Oh, the pleasures of running a blog where I can edit whatever I want, whenever I want! Three words added that should clarify, but it really isn't anything that can't be found with a quick Google search. 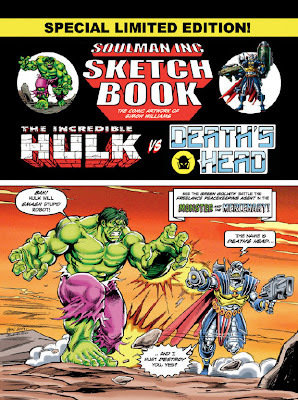 As my companion piece, the interview soon due up elsewhere, should make clear, it is indeed the original incarnation of Death's Head who is the subject of Simon's sketchbook and the new story in Marvel Heroes #33. As far as Nova goes, I know issue #17 said something about Death's Head II/Minion, but I don't have it (yet) to examine just what. I have been hoping to read this story for some time, but alas the sketchbook doasn't seem to been available to buy online? If anyone comes across a spare copy, please let me know.